In 2012, the continuing economic crisis strongly impacted electricity demand, expanding the gap between demand and supply which, inversely, continued its expanding trend. The electrical energy traded on the day-ahead market decreased considerably once again (-4.4%), after the reduction of 2011 (-2.2%), dropping down to levels below those of 2004, the year in which the Power Exchange opened. Imports from abroad are also down, and have reached historical lows. On the other hand, sales from renewable energy plants are decisively up (+24.1%), driven by new photovoltaic and wind power plants. The notable decrease in over the counter exchanges (-8.7%) caused a reversal in the market liquidity trend, which began to grow once again after three years, reaching 59.8%. 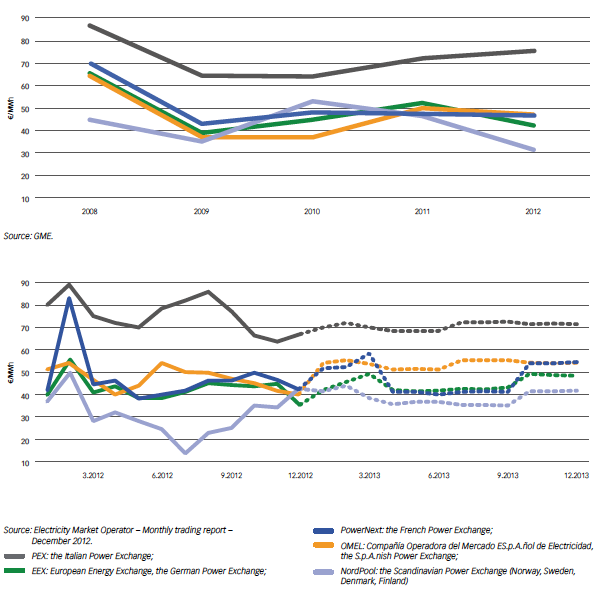 Despite low electricity demand and the general downward trend of prices on the main European exchanges, the energy purchase price on the Italian Power Exchange increased by 4.5% (although this increase is more limited than +12.6% in 2011), arriving at 75.48 €/MWh, a level which is in any event lower than the figure from 2008 (86.99 €/MWh), the last year before the economic crisis. Sale prices in the two island zones are still significantly higher than in the continental zones, with a spread between Sicily and the South (the highest and lowest prices in the ranking for the last four years) which is stable at around 25 €/MWh. Finally, the growth in volumes on the electricity forward market was definitively consolidated in 2012, and the 2013 annual base load closed the trading period at 70.30 €/MWh. As regards the Italian electricity exchange, the average purchase price for electricity (PUN) stood at 75.48 €/MWh, an increase of 3.25 €/MWh over last year. An analysis by time bands shows an increase of 3.57 €/MWh at peak times (+4.3%) and of 3.07 €/MWh off-peak (+4.6%), with prices respectively standing at 86.28 €/MWh and 69.77 €/MWh. The peak price/baseload ratio confirmed a continuously decreasing trend, updating the all-time low to 1.14 (previously 1.50 in 2005). The increases recorded in fuel prices in euro do not seem to have significant impacts on the main electricity markets, which are generally down compared to 2011, despite the peak in February due to the exceptional cold front that crossed the continent. The decrease involves all lists, with prices aligned at around 42/49 €/MWh in central Europe and in Spain (-4/-17%) and equal to 31.20 €/MWh in the Scandinavian region, where the greater decrease (-33.7%) made the value the lowest of the 2008-2012 period. The Italian price avoided the general trend in this case as well, and rose to 75.48 €/MWh due to a slight recovery (+4.5%) entirely concentrated within the first eight months of 2012. In fact, an analysis during the year shows two strongly conflicting trends on our national market: the moderate upward push observed until August was countered, and its effects were partially offset, by the decisive inversion of the trend in September-December. The latter trend seems to reflect both the clear situation of system overcapacity, caused by the lasting stagnation of demand and the consolidation of the renewable component of the supply, as well as the simultaneous decrease in the internal price of gas, the reference fuel in Italian energy generation. On the other hand, countering the trend of the 2012 results, for the year to come the markets are forecasting generalised moderate growth in electricity prices, with a markedly seasonal nature for France and Germany, with the only exception of Italy, where the price is expected to decrease and remain essentially stable over the months at around 70 €/MWh.